ACEC-SK was very pleased to present Saskatchewan’s Finance Minister, Donna Harpauer, as the keynote speaker at the 2018 AGM on June 7th. She addressed both public and private sector capital investment in her 30-minute address. She outlined the many and varied provincial government investments in infrastructure projects as well as monies anticipated from the federal cost-sharing programs. As well, Minister Harpauer pointed to the considerable private sector investments in this province and the need to attract more, despite the headwinds faced by the provincial government that are out of its control. 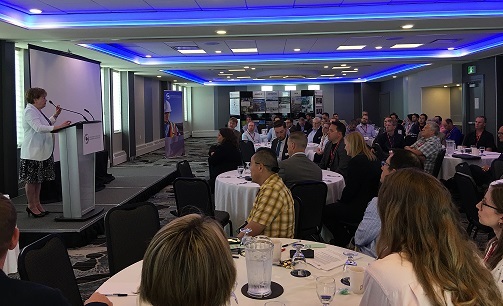 The Minister entertained numerous questions from the audience regarding the consulting engineering industry, including about procurement, as well as more general questions about the provincial economy. After her presentation, the Minister and her Chief of Staff remained to enjoy lunch with members of ACEC-SK’s executive team.